Royal Palace of Madrid and Alcazar de Segovia will appeal to history buffs. Satisfy your inner culture vulture at Museo Nacional del Prado and Museo Lázaro Galdiano. Get out of town with these interesting Madrid side-trips: Segovia (Catedral de Segovia & Segovia Aqueduct). There's lots more to do: see the interesting displays at Thyssen-Bornemisza Museum, admire the masterpieces at Museo Cerralbo, admire the landmark architecture of Plaza Mayor, and take an in-depth tour of Museum Sorolla. For other places to visit, photos, and more tourist information, you can read our Madrid trip itinerary builder. Winnipeg, Canada to Madrid is an approximately 19-hour flight. The time zone difference moving from Central Standard Time (CST) to Central European Time (CET) is 7 hours. Expect warmer temperatures when traveling from Winnipeg in January; daily highs in Madrid reach 11°C and lows reach 1°C. Finish your sightseeing early on the 16th (Tue) so you can travel to Lanzarote. Get in touch with nature at Playa del papagayo and Surf Spot Famara. 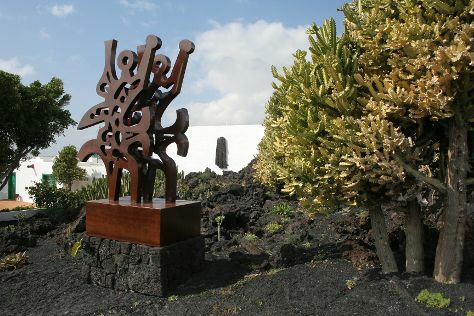 Explore hidden gems such as Fundacion Cesar Manrique and Los Hervideros. Explore Lanzarote's surroundings by going to Casa / Museo Cesar Manrique (in Haria), Montana Roja (in Playa Blanca) and El Lago Verde (in El Golfo). The adventure continues: explore the fascinating underground world of Cueva de los Verdes, take some stellar pictures from Mirador del Rio, explore the striking landscape of Timanfaya National Park, and admire the natural beauty at Jardin de Cactus. For reviews, maps, traveler tips, and other tourist information, read our Lanzarote online itinerary creator. Fly from Madrid to Lanzarote in 5 hours. Alternatively, you can do a combination of train and ferry. You'll gain 1 hour traveling from Madrid to Lanzarote due to the time zone difference. When traveling from Madrid in January, plan for a bit warmer days and warmer nights in Lanzarote: temperatures range from 24°C by day to 17°C at night. Cap off your sightseeing on the 20th (Sat) early enough to travel to El Cotillo. 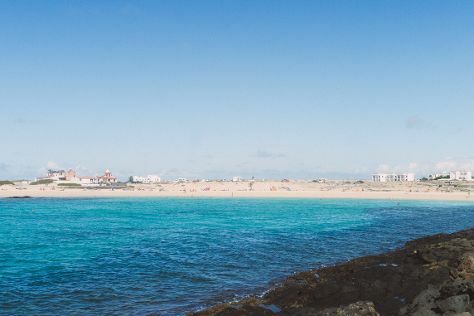 Explore hidden gems such as El Cotillo Beach & Lagoons and Parque Natural de Corralejo. Iglesia de Nuestra Senora de la Candelaria and Monumento Natural de Caldera de Gairia will appeal to history buffs. Go for a jaunt from El Cotillo to Caleta de Fuste to see Dreams House Museum about 44 minutes away. To see ratings, more things to do, where to stay, and tourist information, read our El Cotillo tour planner. Do a combination of car and ferry from Lanzarote to El Cotillo in 2 hours. Alternatively, you can do a combination of bus and ferry. In January in El Cotillo, expect temperatures between 24°C during the day and 18°C at night. Wrap up your sightseeing on the 25th (Thu) to allow time to drive to Morro del Jable. 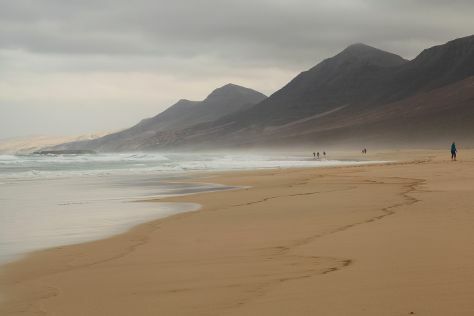 On the 25th (Thu), tour the pleasant surroundings at Playa del Matorral and then kick back and relax at Playa de Cofete. On the 26th (Fri), you'll have a packed day of sightseeing: stroll through Playa de Sotavento and then enjoy the sand and surf at Sotavento Beach. To see where to stay, more things to do, reviews, and more tourist information, go to the Morro del Jable trip itinerary maker. Getting from El Cotillo to Morro del Jable by car takes about 2 hours. Other options: drive; or take a bus. In January in Morro del Jable, expect temperatures between 24°C during the day and 18°C at night. Finish up your sightseeing early on the 27th (Sat) so you can travel to Maspalomas. Get a sense of the local culture at El Faro de Maspalomas and Vegueta. Your inner history buff will appreciate La Fortaleza Centro de Interpretation and Basilica de la Virgen del Pino. Take a break from Maspalomas with a short trip to Playa de Las Canteras in Las Palmas de Gran Canaria, about 48 minutes away. And it doesn't end there: enjoy the sand and surf at Playa de Amadores, take in the awesome beauty at Roque Nublo, stroll through Playa de Maspalomas, and look for gifts at Tresor Noir. To find more things to do, where to stay, photos, and other tourist information, use the Maspalomas vacation planner. 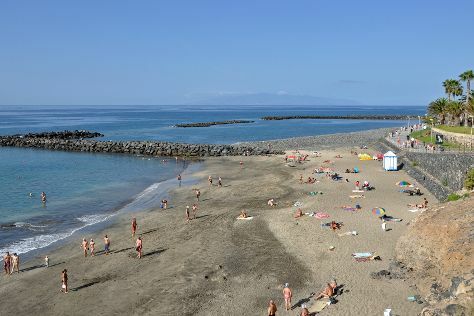 Do a combination of ferry and taxi from Morro del Jable to Maspalomas in 4.5 hours. Alternatively, you can do a combination of bus and flight. In January, plan for daily highs up to 24°C, and evening lows to 18°C. On the 31st (Wed), wrap the sightseeing up by early afternoon so you can travel to Adeje. 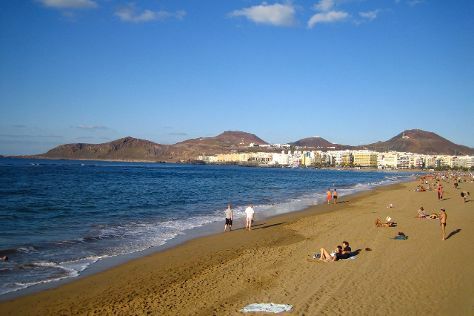 Take a break from the city and head to Playa Del Duque and Playa de las Vistas. Relax by the water at El Medano and Los Cristianos Harbour. Step out of Adeje to go to Masca and see Masca Walk, which is approximately 38 minutes away. The adventure continues: take your sightseeing to a higher altitude at Teide National Park, look for gifts at Chessies Internet Cafe Bar, ponder the design of Light and Music Fountain, and admire the verdant scenery at Masca Valley. For where to stay, more things to do, other places to visit, and more tourist information, read Adeje itinerary planner. Traveling by flight from Maspalomas to Adeje takes 3.5 hours. Alternatively, you can do a combination of ferry and car. In January, plan for daily highs up to 24°C, and evening lows to 17°C. Finish your sightseeing early on the 5th (Mon) so you can travel to Figueres. Figueres is the capital of the comarca of Alt Empordà, in the province of Girona, Catalonia, Spain.The town is the birthplace of artist Salvador Dalí, and houses the Teatre-Museu Gala Salvador Dalí, a large museum designed by Dalí himself which attracts many visitors. Get some historical perspective at Dali Museum-House and Romanya de la Selva. Discover out-of-the-way places like Dali Theatre-Museum and Castillo de Tossa de Mar. Explore Figueres' surroundings by going to DeVinoCatas (in Vulpellac), Vila Vella (Old Town) (in Tossa de Mar) and Monastery Sant Pere de Rodes (in El Port de la Selva). 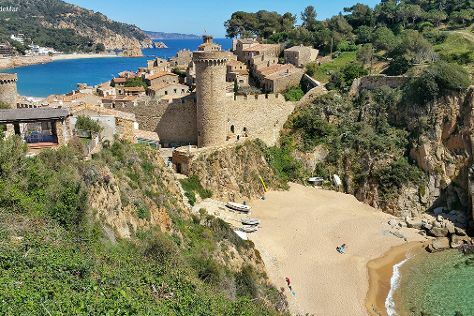 The adventure continues: steep yourself in history at Beget Village, explore the historical opulence of Castell de Sant Ferran, contemplate in the serene atmosphere at Girona Cathedral (Catedral), and enjoy the sand and surf at Fenals Beach. To find ratings, more things to do, maps, and other tourist information, use the Figueres tour planner. You can fly from Adeje to Figueres in 6.5 hours. Alternatively, you can do a combination of ferry and car. The time zone difference when traveling from Adeje to Figueres is 1 hour. Prepare for a bit cooler weather when traveling from Adeje in February: high temperatures in Figueres hover around 14°C and lows are around 5°C. Wrap up your sightseeing on the 10th (Sat) early enough to take a train to Barcelona. Discover out-of-the-way places like Montserrat Monastery and Ciutat Vella. Get some cultural insight at El Barri Gòtic and Park Güell. The adventure continues: pause for some serene contemplation at La Sagrada Familia, admire the landmark architecture of Güell Palace, examine the collection at Museu Nacional d'Art de Catalunya - MNAC, and step into the grandiose world of Montjuic Castle. To see reviews, more things to do, where to stay, and tourist information, read our Barcelona vacation builder. Traveling by train from Figueres to Barcelona takes an hour. Alternatively, you can drive; or take a bus. February in Barcelona sees daily highs of 16°C and lows of 7°C at night. 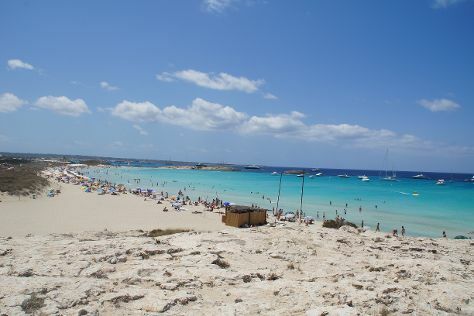 On the 15th (Thu), wrap the sightseeing up by early afternoon so you can travel to Formentera. On holiday on Formentera, you'll enjoy the simple charms of island life. Start off your visit on the 16th (Fri): get outside with Sabarca de Formentera and then tour the pleasant surroundings at Estany des Peix. Here are some ideas for day two: enjoy the sand and surf at Playa de Ses Illetes, then take some stellar pictures from Torre de sa Punta Prima, and then tour the pleasant surroundings at Playa Ses Platgetes. To find reviews, maps, where to stay, and more tourist information, read Formentera trip builder. Fly from Barcelona to Formentera in 4 hours. Alternatively, you can ride a ferry. In February, daytime highs in Formentera are 18°C, while nighttime lows are 8°C. 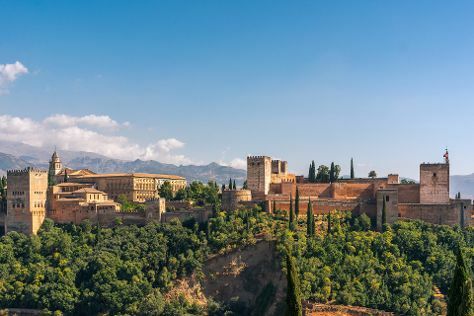 Finish up your sightseeing early on the 18th (Sun) so you can travel to Granada. Appreciate the collections at Museo Automovilistico and Museo Picasso Malaga. Discover out-of-the-way places like Castillo de Gibralfaro and Catedral de la Encarnación de Málaga. Go for a jaunt from Granada to Antequera to see El Torcal Natural Park about 1h 40 min away. And it doesn't end there: step into the grandiose world of Alhambra, take in the architecture and atmosphere at Iglesia del Sagrario, steep yourself in history at Casa-Museo de Manuel de Falla, and get to know the fascinating history of Albayzin. To see photos, other places to visit, and other tourist information, you can read our Granada trip itinerary planner. Traveling by flight from Formentera to Granada takes 6 hours. Alternatively, you can do a combination of ferry and car; or do a combination of ferry and bus. Traveling from Formentera in February, expect Granada to be little chillier, temps between 13°C and 3°C. Finish your sightseeing early on the 23rd (Fri) so you can drive to Seville. Explore hidden gems such as Gruta de las Maravillas and Maria Luisa Park (Parque de Maria Luisa). Royal Alcázar of Seville and Barrio Santa Cruz are good opportunities to explore the local culture. Change things up with these side-trips from Seville: Museo de la Cabalgata (in Higuera de la Sierra) and Ronda (Museo Lara, Puente Nuevo, & more). Next up on the itinerary: admire the striking features of Plaza de Espana, admire the masterpieces at Seville Museum of Fine Arts, tour the pleasant surroundings at Casa de Pilatos, and take in the architecture and atmosphere at Iglesia de Santa Cruz. To find traveler tips, photos, and more tourist information, go to the Seville holiday planner. Traveling by car from Granada to Seville takes 3 hours. Alternatively, you can take a bus; or take a train. Prepare for somewhat warmer weather when traveling from Granada in February: high temperatures in Seville hover around 18°C and lows are around 8°C. Finish your sightseeing early on the 27th (Tue) to allow enough time to drive to Caceres. Cáceres is the capital of Cáceres province, in the autonomous community of Extremadura, Spain. Convento de El Palancar and Mina Costanaza will appeal to museum buffs. 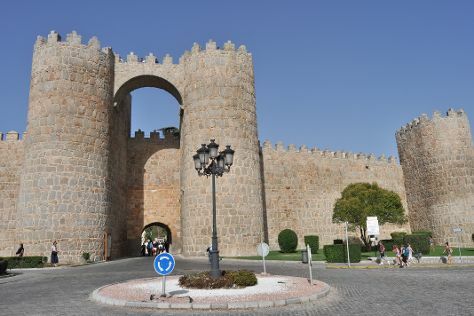 Old Town of Caceres and Castillo de Trujillo (Trujillo Castle) will appeal to history buffs. Venture out of the city with trips to Museo Histórico Etnográfico Villafranca de los Barros (in Villafranca de los Barros), Castillo de Luna (in Alburquerque) and Iglesia de Santa Maria la Mayor (in Trujillo). There's lots more to do: contemplate the long history of Salvatierra de Santiago, explore the historical opulence of Palace of the Marqueses de Torreorgaz, take in the architecture and atmosphere at Santa Maria Church-Procathedral, and contemplate in the serene atmosphere at Royal Monastery of Santa Maria de Guadalupe. To see traveler tips, where to stay, and other tourist information, read our Caceres itinerary builder. You can drive from Seville to Caceres in 3 hours. Other options are to take a bus; or take a train. Expect a bit cooler evenings in Caceres when traveling from Seville in February, with lows around 5°C. Cap off your sightseeing on the 4th (Sun) early enough to go by car to Avila. Get some cultural insight at The Walls of Avila and Castillo de Oropesa. Step off the beaten path and head to Ieronimus and Parroquia de los Santos Juanes. You'll find plenty of places to visit near Avila: Abejas del Valle La Casa de las Abejas (in Poyales del Hoyo), Salamanca (Old Cathedral (Catedral Vieja), Casa Lis, & more) and Alba de Tormes (Basílica de Santa Teresa & Iglesia de la Anunciacion y Sepulcro de Sta Teresa). Next up on the itinerary: pause for some serene contemplation at Iglesia de Santa Maria, explore the historical opulence of Palace of Los Bracamonte, and contemplate in the serene atmosphere at Catedral de Ávila. To see more things to do, traveler tips, maps, and other tourist information, refer to the Avila vacation trip planner. You can drive from Caceres to Avila in 3 hours. Another option is to take a bus. Traveling from Caceres in March, expect Avila to be little chillier, temps between 16°C and 1°C. You'll set off for home on the 10th (Sat).